I was bored at work today (an everyday occurrence) so I started trawling through beer infographics online, when I came across this one: 10 signs you might be a beer snob. Now, I’ve been getting called a beer snob quite a lot lately, but I’ve never ever refused to drink a beer I want because I didn’t have the right glassware. Sure, a tiny part of me will be gutted that I don’t, but I will let nothing get between myself and a good beer – not even if I have to drink a porter in a flared tulip glass. But I do judge the people who buy what I deem “bad beer” in the supermarket, and I won’t serve a beer that a mate has brought over if the beer in my fridge is better. That’s not necessarily because I’m rude; it’s because I’m a kind-hearted beer lover who wishes to educate the world about the best beers. Okay, maybe I am a beer snob after all. How about you? 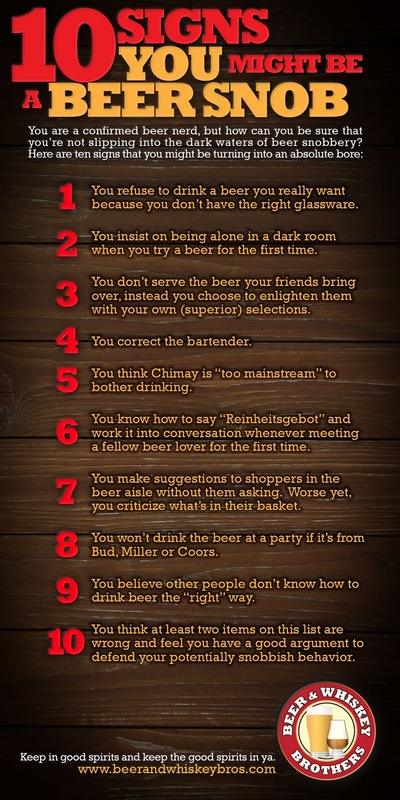 How many of the items on this list of 10 describe you and your beer drinking habits?